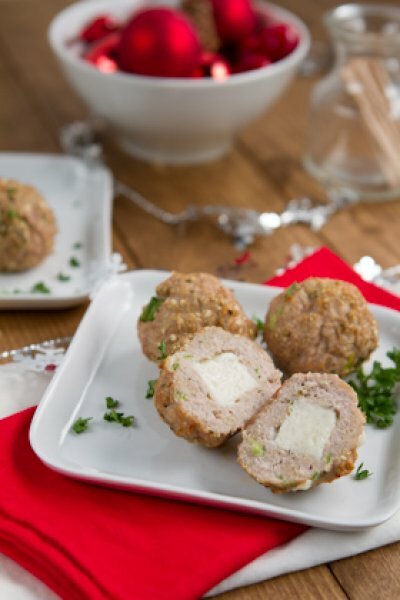 Lean ground turkey balls seasoned with Italian spices and stuffed with a piece of mozzarella goat cheese. Combine turkey, onions, garlic, soy sauce, oregano and basil in a small bowl. Mix with hands and roll into 12 medium-sized balls. Place on prepared baking sheet when complete. Take one ball in the palm of your hand, press a hole into it with the tip of your thumb. 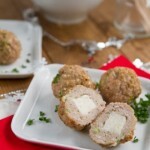 Stuff a mozzarella cube into the hole and pinch the sides of the turkey ball to cover. Roll between your palms again to get as smooth as possible and return to the baking sheet. Place in the oven for 15-20 minutes, until internal temperature reaches 165F. Remove and allow to cool slightly before serving with a sprinkle of fresh parsley. Enjoy on their own as an appetizer, or pair with a plate of pasta and red sauce. Quinoa flakes can be replaced with gluten-free breadcrumbs, milled flax seed or almond flour.